Kypri Beach is one of the most windless beaches on the island. In a bay considered to be the most protected by the wind anchorages that can be found in Greece. It lies on the west side of Andros, just before Golden Sand and St. Peter’s beach, places particularly famous. One would say that with such strong names near her, she would remain silent and humble without being able to attract people, but no. It is beautiful in its simplicity. It is clean and has crystal blue waters. Its sand is soft and lends itself to endless romantic, barefoot walking alongside the waves. Access to Kypri Beach is not at all hard. On the contrary, it is easy to approach, since it is right on the main road that leads from Batsi to Gavrio. Anyone who lives in these areas should not neglect to visit it. Kypri Beach deserves the time of every visitor. It’s worth one or more days to give her, as the beach can offer a genuinely unique swim. 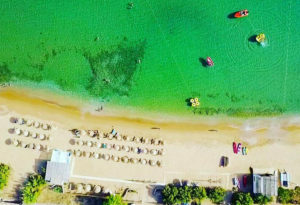 Kypri Beach is excellent and because of the sandy beach, it is an ideal choice for families with young children who can make use of its powdery sand for playing and building castles. It is organised, so no one is worried about its shades and sun loungers. It has parking space, so no one is worried about where to leave the car or its motorcycle. In addition, there is a bus service, which solves the problem for anyone. Kypri Beach offers solutions for light food and drink as there are three beautiful beach bars. One of them is La Cantine and the second is the Perrakis hotel Kypri Beach Bar. The third one is WeSurfin’ which is a combination of a beach bar and Windsurf and Sup courses and rentals.